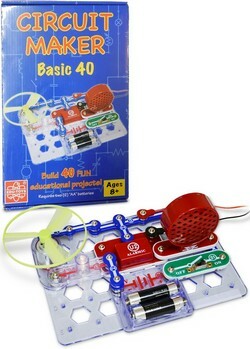 Snap your individual Circuit Maker components together in your, Circuit Maker Basic 40, a dynamic introduction to electricity and electronics. 40 projects include launching glow fans(UFO),simple light circuits, creating alarms, investigating inline and parallel circuits and completing more functional experiments all while amazing your friends and family with your practical electronics skills! Instruction manual includes the basic dos and don'ts of electricity and electronics. Contains 17 Snap Circuits parts including a snap board base and project manual. 2 AA batteries needed but not included. For ages 8 & up. NO TOOLS REQUIRED.